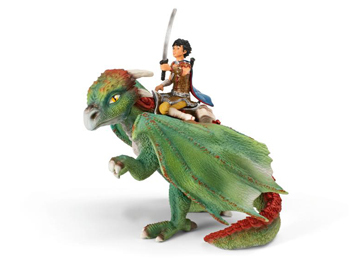 Schleich 70447 - Kishay is the best friend and dragon rider of teenage Nugur and is ready for battle; Kishay in his unique armour with his sword proudly raised to the sky, and Nugur well trained in battle since he first appeared as a baby in Bayala in 2010. Measures 6" x 6" x 6". Figures are hand-painted.